With the advent of printing, texts multiplied. Numbers fortified books against accident and made it possible to distribute them widely and immediately, to wholly unanticipated readers. The nature of the book had been otherwise in the age of scribal production. Manuscripts were produced singly; literary survival was more precarious; no author could expect better than a limited initial circulation of a work, among friends and neighbors. A professor of Classics at the University of Cincinnati and now at Duke University, William Johnson began exploring "cultures of reading" twenty years ago, with his 1992 Yale Dissertation on The Literary Papyrus Roll. He elaborated and published this essay in 2004 under the title Bookrolls and Scribes in Oxyrhynchus (this research underpins chapter 2 of the present volume). The thesis of the present book, that ancient reading needs to be understood within specific, intimate and informal social contexts, he first aired in a decorated article entitled "Toward a Sociology of Reading" (AJPh 121 , 593-627) and developed further in a 2009 collection of essays, edited with his quondam colleague at Cincinnati, Holt Parker, entitled Ancient Literacies: Cultures of Reading in Greece and Rome. Johnson lays out his argument in the first chapter, "Reading as a Sociocultural System": "literary texts were deployed as part of the negotiated construction of a community that centered around literary texts" (16). He approaches his argument by way of a discussion of the debate about silent reading. He criticizes participants for their insistence on treating reading as a cognitive event: "[I]s reading solely, or even mostly, a neurophysiologically based act of cognition? Anthropologists, ethnographers and sociolinguists have increasingly come to recognize in reading a complex sociocultural construction that is tied, essentially, to particular contexts" (9). Reading is manifestly both, and neither is negligible; individual psychology, including even the neurophysiology of the brain, is implicated with social practice. Nevertheless, his point is attractive and persuasive: the social context of reading has been disregarded. Johnson rightly remarks that in antiquity reading was practiced both silently and aloud, and that the emphasis on one over the other has led to the disregard of the social functions of both. Elsewhere in the book Johnson will make use of aspects of the arguments from this debate, calibrated to apply to his own emphasis on the social context of writing. For example, Paul Saenger's arguments about the cognitive implications of scriptio continua are roughly handled in Chapter 1 (7), but are favorably revived in a discussion of nuanced oral reading as a social status marker (23-25, 201). After a second preliminary chapter on "The Pragmatics of Reading," the remainder of the book is devoted to a series of "case studies" of some "reading communities" of the High Empire. Chapter 3 is devoted to the reading community of Pliny, chapter 4 to the literary interactions described in Tacitus' Dialogus. Chapter 5 deals with the medical milieu of Galen; chapter 6 with the idealized reading culture seen in Aulus Gellius. 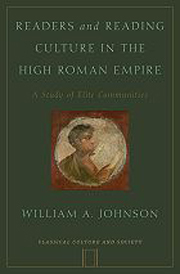 In chapter 7 Johnson discusses Fronto and Marcus Aurelius, in chapter 8, Lucian and literary patronage. In the last chapter he turns to some of the evidence for reading and book collecting from the papyri. The organization allows Johnson to balance the presentation of the nuances of various literary contexts with the presentation of larger, recurring themes. Some of the more important topics discussed include the place of reading in the "daily regimen" of a senator; the significance of formal recitations; the creation and "publication" of texts; solitary reading; excerpting; and literary pretension. Such themes are clearly marked off with sub-headings, and the index seems thorough and reliable. There is remarkably little repetition. Johnson writes vigorously, and the book is entertaining and stimulating. The research is thorough, the presentation persuasive: few readers will come to the end of the book with any doubts about his central argument. Some, however, will set it down wanting more. Johnson's presentation is resolutely descriptive, and he is cautious about pursuing the general implications of Roman "communal reading." For example: is communal reading a human universal? Johnson appears to suggest so (9-13). Given his refined sensitivity to the small fissures that distinguished elite Roman reading communities, it is odd that he gives little attention to the comparative abyss that separates the ancient from the modern experience of the book. 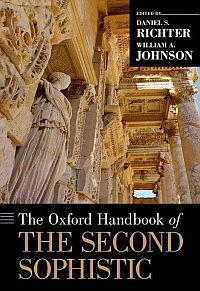 Certainly moderns may continue to enjoy books in communal environments: Johnson's book, for example, is written for a relatively small group of scholars, and will elicit responses in the form of book reviews, citations and classroom discussions. And there are obviously other modern reading communities as well. But what attenuated communities these are! The circumstances of book distribution in a scribal culture encourage the location of reading in smaller, local groups: manuscripts circulated narrowly in antiquity, produced individually and shared, whether as gifts or loans, among friends. The mass distribution that makes printing possible and profitable militates against the association of publications with intimate groups. The profit motive is a necessary support of mass production; and when books are manufactured with an eye to speculative sales, they are not so much shared as marketed. Printed books may be enjoyed communally; but they are made for an atomized universality. Johnson's contextualizing definition of literary meaning also cries out for extended exploration (cf. 12: reading is the "negotiated construction of meaning with a particular sociocultural context"). I am not so hostile to this idea as some literary critics may be, though I do regard it as an overstatement, mirroring the repudiation of "neurophysiological" approaches to reading. Some modern schools of literary criticism are formalist, that is, the object of interpretation is restricted to the "text" (cf. emblematic claims such as "there is nothing beyond the text" vel sim.). From Johnson's position, it might be possible to argue that strict literary formalism is itself the by-product of the modern dis-integration of reading from specific communal contexts; but he does not pursue such implications. Modern authors publish to be read, and as widely as possible: in part for the fame, in part to make money. Ancient authors made no money from sales of their work, but they too fantasized about attaining universal and eternal literary fame. Some - Homer and Vergil, for example - attained it. In the modern nationalist world, literary canons help to break down potentially divisive local communities of reading. I doubt that canonical texts had the same function in the ancient world. Perhaps Johnson will explain elsewhere what he thinks about the nature of ancient canon-formation and its relationship to local communities of reading. In the meantime, this book deserves to find a wide readership - and not only within the narrow reading communities of professional classicists and historians.